I travel to Miami, Florida every year to cover Maryland artists that exhibit their work at Art Basel, one of the most celebrated art festivals in the world. 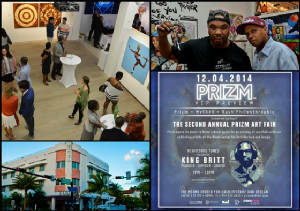 This year a talented group of artists from the DC-Baltimore area participated in the Prizm Art Fair at the Miami Center for Architecture and Design. Wesley Clark, Jamea Richmond-Edwards, Shaunte Gates, Amber Robles-Gordon, Adrienne Gaither, Stan Squirewell and Holly Bass exhibited several pieces in the show. 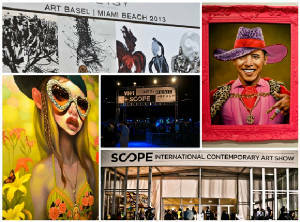 The event was curated by Mikhaile Solomon, a Miami designer, arts advocate and producer. I also had the opportunity to interview Demont Pinder, a prolific contemporary artist from Oxon Hill, Maryland. Mr. Pinder was in the process of creating a live painting at the Brisky Gallery in Wynwood arts district of Miami. Amber Robles-Gordon, an accomplished mixed media artist, was a featured participant in the 2013 Prizm Art Fair. Amber's work in Prizm is from a project entitled "Heal Thyself".